Hopes dashed and completed irked with the way Kelly had pointed out the obvious, I put my dream of owning a van with plaid curtains and a mini fridge on hold. Fast forward three months. I’ve been working as a landscaper for Bud Jones & Sons out of Mason, Ohio. I had shared with my boss (and any one else who had a pulse) about my desire to own a VW bus and during lunch that day he mentioned to me that someone that used to work for the company had a van he was looking to sell or trade for landscaping work. My boss said it wasn’t a VW, but that it had a lot of character. I decided to check it out. I found my way to the guys house that owned the van and he gave me the keys and showed me around his 1961 Ford Falcon van. 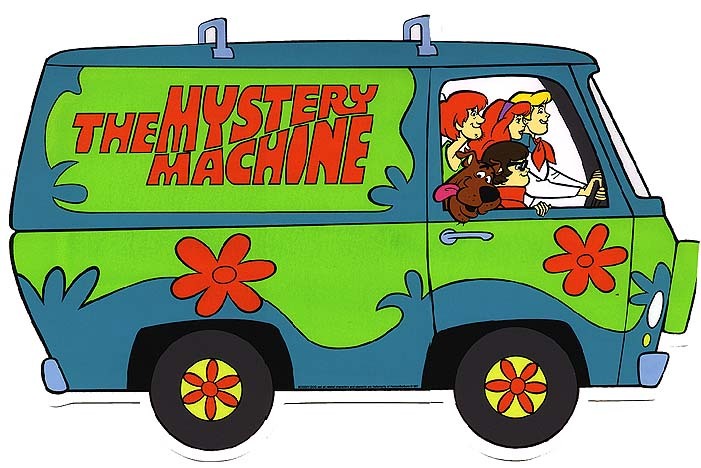 As we approached the 36 year old vehicle only two words came to mind: Mystery Machine. While it was white and the Mystery Machine was rather colorful (and lacking windows), I couldn’t help but be swept away by the beauty of this amazing piece of American machinery. We walked around the van and the seller told me about how he had given it new brakes, rebuilt the engine, put new tires and rims on it and basically taken care of everything mechanical problem. Like udders in the hands of a farmer or mud on the face of a pig—I felt completely in my element getting behind the wheel for a test drive. For the first time ever I learned about things like “three on the tree” (which made for an interesting start! ), lead additives in gasoline, the existence of foot powered washer fluid sprayers, and old school built in coffee warmers (the engine was right where one might rest their right arm). I finished up my test drive and asked the seller, “How much?” He replied, “$1,000.” Now a grand back then was like ten grand now. Not wanting to give up on the dream, I asked him if he’d be willing to trade anything for it and he said he’d take $500 cash and let me work 40 hours for his landscaping company to pay the other half off. So what else is a wide-eyed, Falcon-crazed, 20-something supposed to do? I emptied my bank account, signed on the dotted line and worked 40 of the most mind-numbing hours of my life weed-eating miles upon miles of endless Ohio greenery. But I had my van. The van. Oh, it was a piece of work. Over the next few months I worked to restore the interior. Fixing the speedometer, painting the floor and installing carpet (it had a bare metal floor when I bought it). I loved driving around in it. Not only was it fun to drive—it could haul full sheets of plywood (which worked out great in those days when I was managing my skate park ministry). That van and I were tied at the hip. I loved it and (I think) it loved me back. We weathered 12 inches of snow on 13″ rims, taught skate park kids how to drive in the church parking lot, hauled skate park tools and supplies around and every once and a while hauled everyone to Taco Bell for 69 cent tacos and endless Mountain Dew. Then one day—completely out of the blue—I decided to buy a brand new, 1999 Nissan Frontier (King Cab). While I loved my van, the appeal of that new car smell and small things like…air conditioning (ever been to Ohio in August? )…fuel economy…safety (the van had no seat belts)…and the ability to defrost my windows without having to use Kelly’s hair dryer overcame my love for the Ford Falcon. Now unfortunately, Kelly and I lived in a townhouse and there we were only given two parking spaces. I decided it would be best to sell my dream van—not only for the space I needed for the new truck, but because I could sure use some cash as I was now paying $400 per month for car payments as well as an increase of 300% on my car insurance. I phoned up Auto Trader and placed my van for sale in the auto classifieds section. I was surprised when all of Cincinnati and the tri-state area wasn’t knocking down my door for a test drive. But finally, just before I was about to leave for a missions trip to Mexico, I had an interested party. Young, naive, and wooed by it’s beauty, the 20-something kid came to test drive the van. We drove around and he asked questions about the Falcon. I showed him the foot powered windshield washer sprayer, the fact that you can open the hood inside the van and tune it as you’re driving down the road, and all the other little things that made the van so mesmerizing. As we drove I could see that glassy eyed, romantic look in his eyes. I thought for sure I had the van sold. As we drove we talked and I got the impression that this kid was like most college kids out there: chasing after girls, excited about the next beer-pounding extravaganza, and looking to fill his heart with every other vice that will never satisfy and only leave him feeling like how I almost always kept the van’s fuel levels…empty. We pulled into the parking space and he said he’d buy it in a heartbeat, but that he would need to come up with the money. He called me later to tell me that he wouldn’t have enough to purchase it. I told him I understood, hung up the phone and continued packing for my trip to Mexico the next day. I’ve read this verse before. As I’m reading I take note that I’ve already highlighted this passage and that other’s have brought it to my attention as well (I always put someone’s initials and a date next to a scripture passage that is given to me in a letter or some other note). Needless to say—this passage isn’t new to me. I know what it means and I’ve tried to live by it. But as I read it I feel God pulling on my heart speaking these words to me: Give the van away. “Give it away?” i question. “Yes. Give it away.” I hear God telling me. All that to say – I didn’t need God to bring fire from heaven. I heard the quiet voice of the Holy Spirit confirming in me that I had an opportunity to serve him and secure a reward from him in heaven. I prayed and resolved that I would call up that kid who wanted to buy the van and offer it to him at only one price: 30 minute of his time. In that 30 minutes I planned to share the Gospel with him and explain to him how God loved him and had a plan for his life. i would tell him what I told the kids at my skate park…that God thought he was the best thing since sliced bread and wanted to know him. My heart swarmed like electrified red jello as I ran through the conversation in my mind and played out the transaction in my mind. The kid would be shocked to hear that I wanted to give him the van …I would tell him of God’s love, answer any questions he may have, give him the keys and the title and say good bye and pray that God would do an amazing work in his life. It was a great plan. God’s plan. And I was excited to be his servant. On the drive back to the church from the airport I shared my excitement with a close friend about my decision to give away my van. Surprised, he offered to me that it would be better to just sell it. After all – I need to provide for my family and think about them first. I believed that God speaks to us through the Bible, through sermons, through prayer and also through Christ-centered friends. As I listened to my friend speak I was persuaded to ditch what I felt God had called me to. Persuaded that my family came first, I pushed away any thought of giving away my van. Oh how I wished I would have stayed the course. Maybe it was due it part to my friend’s convincing arguments. Maybe it was the fear to be so bold in my faith. Maybe both. Bible-study group, something tragic happened: They talked him out of it. Randy’s story reminded me of my own story. What I call the Ford Falcon Treasure Principle. Alcorn’s words and Christ’s words mentioned in The Treasure Principle have stirred in me a passion to take a closer look at money and possessions. I want God to speak into my life and my finances like did when I was 21. The truth is…I’ve probably listened to other believers too much. I need to get back to listening for God’s voice and not letting any other voice drown his out. Jesus – bring me back to that place of surrender and give me the courageto follow through on the plans you whisper to me. help me to not give into what I or others may think is the better idea. Help me to follow you and storeup treasure in heaven. After all, I came here with nothing and I leave with nothing. Call me God, I’m listening. – Chris. This entry was posted on November 12, 2008 at 10:41 pm and is filed under My Life. You can follow any responses to this entry through the RSS 2.0 feed. You can leave a response, or trackback from your own site.